Almost 100 years ago, pioneering National Geographic photographer Charles Martin rigged a raft with a mound of highly explosive magnesium flash powder (read: bomb) and set the whole thing off to light up fishy subjects only a few meters deep. No need to risk singed eyebrows or accidental fish fry these days — even the tiny camera on your cellphone, properly encased, is better than the first digital cameras NatGeo used in the early 2000s. The first underwater photos I ever took were shot in 2004 with a basic Canon Elph point-and-shoot while working as a Peace Corps volunteer with the Silliman University Marine Laboratory in Dumaguete City, Negros Oriental. I never imagined that little camera would get me my first publication with NatGeo and lead to a full-time career of exploring the world as a photographer. If you’re just getting started with underwater photography, don’t make the jump to a pro-level SLR rig. It’s better to begin with one of the many high-quality point-and-shoot cameras that are available with a polycarbonate clamshell housing. These are usually priced around US$200 or less, and are capable of being used at depths of 40m (the limit for normal recreational diving). I use a Canon G16, which offers pro-level features like full manual mode, raw format (unprocessed file) support and the ability to add an external flash (called a “strobe”). That’s not to say that the more basic or less expensive options out there aren’t also good — the first photo I had published by NatGeo was taken with that little 5-megapixel Elph! Once you have a camera and underwater case, it’s time to set it up for your first undersea adventure. A common mistake made by many an aspiring Jacques Cousteau is to spend too much time underwater fiddling with camera settings and not pay enough attention to what’s going on. I once missed an amazing photo opportunity with a whale shark because I was fine-tuning the shutter speed on my camera. I’ve learned my lesson since. When starting out, it’s best to set up your camera on the beach with one basic setting and then spend your time in the water focused on absorbing and capturing the action around you. A good all-around setting for most cameras is to activate the “shutter priority” mode (you might have to read your instruction manual to find out how to do this), adjust it to a value of 125 — and your camera’s ISO (light setting) to 400 — then set the image quality to the highest possible level supported by your camera. This set-up will have you covered for most daylight shooting conditions down to about 10m. Much of what divers learn in a basic open-water scuba class deals with how to safely make the descent to 40m (over 120ft) and back without getting “bent”. But is it really necessary to push these limits to get a great photo? One of the fundamental rules of great photography is to follow the light, which in the case of underwater photography means staying in the shallows — that means 10m or less. Water is very effective at absorbing colors from the light spectrum — that’s why all you see when you go below 10m is shades of blue. It’s hard to believe that most of the corals and fish down there are brilliantly colored shades of red, yellow, purple and green. There’s no need to weigh this tutorial down with a discussion about the physics of light waves, but just keep in mind that once you venture below 10m, you’re going to be shooting monochrome unless you bring an artificial light source (such as a strobe) along. This means that you don’t even have to be a scuba diver to take great underwater photos; you can be snorkeling and stay within the optimal depth for using colorful, natural light. One of the most basic rules of composition (ie, what’s in your picture) is to fill your frame. So many otherwise great shots lose that much-needed power because the photographer failed to get close enough to the subject to capture the viewer’s interest. The zoom on your camera is not going to be much help underwater; stretching your lens is only going to amplify the blurry effects of suspended particles or bubbles in the water. Once you’re near enough, be sure to use basic tenets of photo composition such as the “rule of thirds” — placing important elements along imaginary horizontal and vertical lines in the frame for optimal visual effect — to make your shots really pop. Getting close to sea creatures can be a challenge, but here’s a trick that has often worked for me. Imagine that you’re a sea turtle, fish or tiny shrimp on a coral reef. Your survival depends on your ability to blend in with the natural environment and not draw attention to yourself. To an underwater photographer, this means that many of the best subjects are often hiding in plain sight. So one of your jobs is to know where these animals live and how they behave, so you can anticipate where they might appear and have a better chance of capturing them in your viewfinder. This means swimming quietly and not making any sudden movements that might scare the animals. Take care, too, not to step on any corals or touch anything. 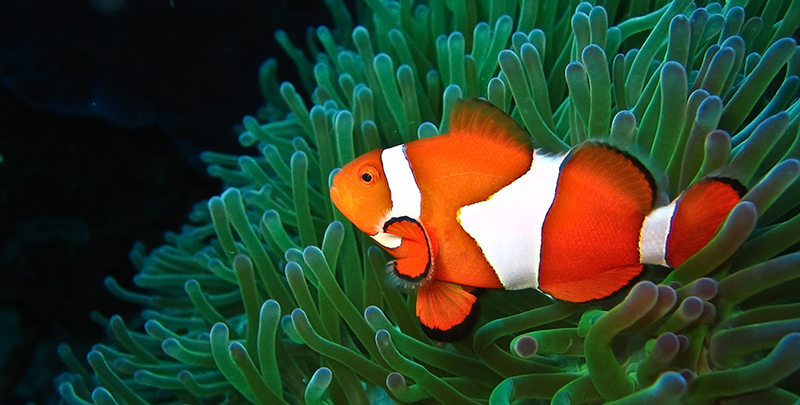 The small flash on your point-and-shoot can’t light up a panoramic reefscape, but it can bring out the colors of a clownfish for a close-up (or macro) shot. Set your camera to the shutter priority mode, lock the shutter at 125, set the flash to “always on” and set your focus control to “macro” (usually designated with a small flower symbol). If your underwater camera case came with a flash diffuser, be sure to use it to soften the harsh shadows cast by the bright light. 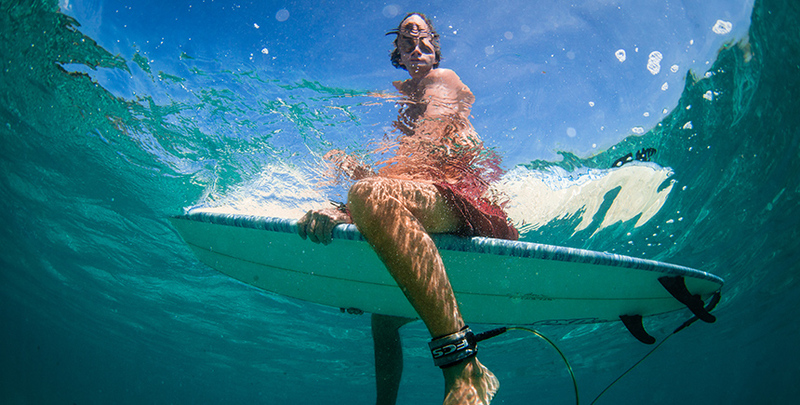 Underwater photography is very much a process of trial and error. 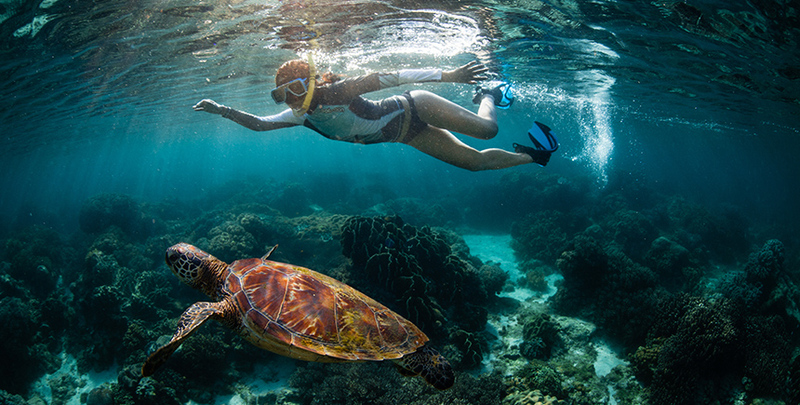 You’re learning how to capture the magic of the marine environments you’re going to discover, and working with wild animals and lighting conditions that are frequently changing. Follow these guidelines on your next photo safari, and you’ll be sure to bring back more shots that you’ll be proud to share.